Rio Mayor Crivella, Caixa Econômica Federal, and construction company, Carvalho Hosken, hope to soon find occupants for the 3,604 apartments used by the Rio 2016 athletes at the Olympic Village in Barra da Tijuca. RIO DE JANEIRO, BRAZIL – Six months removed from the mega-spectacle that was the 2016 Rio Olympics, local news is reporting that Rio city officials are trying to facilitate the sale of the apartments at the Olympic Village, which were the athletes’ residences during the Games. The Rio 2016 Olympic Village in Barra da Tijuca is comprised of 31 buildings up to seventeen stories tall with a total of 3,604 apartments, photo by Gabriel Heusi/Creative Commons License. 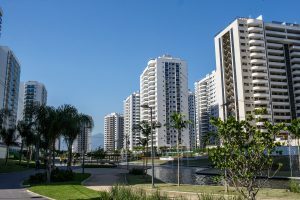 The City of Rio is in discussions with government-owned financial institution, Caixa Econômica Federal (CEF) and construction company, Carvalho Hosken, to sell the Olympic Village, in Barra da Tijuca, the largest athletes’ residence in Olympic history. It is comprised of a seven-condominium complex with buildings up to seventeen-stories tall and a total of 3,604 apartments. 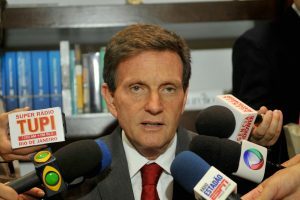 According to O Globo sources, Rio Mayor Marcelo Crivella has struck an agreement with the CEF to provide low-rate financing to sell the units to civil servants. The same report indicated that representatives of the Brazilian Navy have already met with Mayor Crivella and CEF president, Gilberto Occhi, to discuss financial terms of purchasing units for the Navy. Government officials and the CEF are also studying the possibility of creating similar sales programs for the Olympic Village units that would include favorable financing for employees of other state-owned entities, including but not limited to Petrobras, Vale, Eletrobras, Furnas, the Brazilian Army, Banco do Brasil, CEF, and the Brazilian Development Bank (BNDES). Sources have revealed that the initial numbers discussed regarding the prices for the Olympic Village apartments are slightly below market value, with prices ranging from R$6,800 per square meter for the smaller one to two bedroom unit, up to R$7,800 per square meter for the larger three to four bedroom unit. The price of the units is still, however, being negotiated between the city, CEF and the owner and builder of the Olympic Village, the Carvalho Hosken Group. New Rio Mayor Marcelo Crivella, shown here during last October’s municipal election, is in negotiation with Caixa Econômica Federal, and Carvalho Hosken, to soon find occupants for the 3,604 apartments at the Olympic Village, photo by Antonio Cruz/AgBr. Carvalho Hosken’s chief marketing officer, Henrique Caban, told O Globo that considering the unfavorable economic conditions in the country, particularly in the real estate sector, the company is under a great deal of pressure to sell the units. Even more so now because, according to Caban, starting next month, the group will have to pay R$20 million in interest per month on the loan for construction of the vast site. Since March 2016, this expense had been paid by the Rio 2016 Organizing Committee. “One of the ideas is to offer options [to buy the apartments],” Caban said. “Someone interested in the property who does not want to buy it immediately could sign a long-term lease. At the end of the lease, he would have the option to buy the apartment, discounting what he paid for the lease,” said Caban. For its part, the CEF hopes that the government’s plan will allow the bank to not only recover the R$2.3 billion it invested in the construction of the Olympic Village but maybe even make a profit. Officials estimate that the financial institution could raise up to R$3 billion under the proposal. Construction of the Olympic Village began in 2013 on a stretch of approximately 800,000 square meters of land in Barra da Tijuca, called Ilha Pura (Pure Island). The site was considered ideal for the athletes’ village, being accessible to most of the major competition hubs, including the biggest Olympic site, Olympic Park.